Finally got around to blocking this. 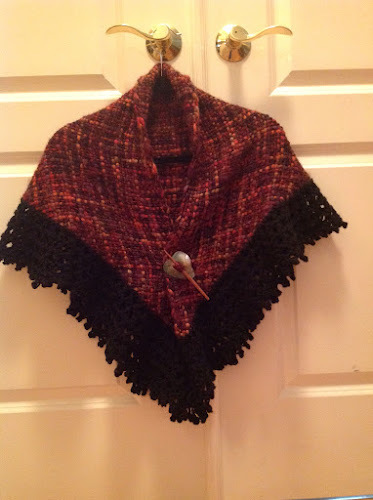 I must confess I wore it a bit before blocking. It NEVER fails to amaze me how much better things look once they are blocked. This was about a 4.5 foot setting on my Triloom. The weaving took very little time and was tons of fun. The knitting took a bit longer than I expected...but was quick for me. 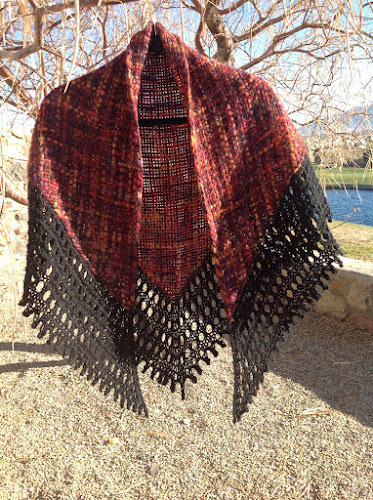 This is a great way to use up some bulky yarn you love but don't have enough for a full size shawl. I used worsted weight for the border but DK would work... Possibly even sock. love the border. what stitch or pattern did you use?